Let’s jump right in today, eh? What do you think the chances are of Blizzard ever hosting smaller regional Blizzcon style events for those of us that find travelling to USA physically or financially prohibitive? Blizzcon Europe? Blizzcon Asia? Blizzcon Oceania? Etc. As others mentioned in the comments, it’s highly unlikely. BlizzCon is primarily run by Blizzard’s own staff from their local office. For the reason, it needs to be somewhat local. In recent years, Blizzard has used PAX East to reach their audience on the east coast and Gamescom to reach Europeans. When can we hear some updates about the site’s progress? Has funding worked out, now that you’ve presumably received the money from last month? Is everything going smoothly? Our Patreon backers will receive a funding update with some specific numbers soon — we’re aiming for the end of the week. The short version for everyone is: the cash value displayed on Patreon is a fair bit higher than the amount the actually processed. We didn’t receive that full $13,000 or whatever it displays right now. If payments failed on the user’s end, we don’t get that kind of information. We just know what we get, and it wasn’t that much. But at the moment, that’s fine. We expected something like that to happen and budgeted accordingly. Advertisements are helping make up for the difference in expected contributions and contributions received. The TL;DR: I think we’re okay at the moment. Obviously, we’re never going to turn down new supporters — more support means we can do more stuff for everyone — but we’re budgeted for what we’re getting. Do you think we will ever see the other side of Azeroth? I’ve heard that any ships which venture there are forever lost, the mists that enveloped Pandaria seem to be at work there as well. I don’t think there’s been any canonical indication that we aren’t seeing both sides of Azeroth on the map. Likewise, people often ask if we’ll ever travel to the southern hemisphere, but there’s no canonical indication that we don’t already have the northern and southern hemisphere. I’ve personally made the argument before that the southernmost zones in the game right now suggest climates based on/near an equator, but it’s a fantasy world and those rules don’t necessarily apply. At the same time, Chris Metzen has personally said he gets grumpy when the artists add globes as doodads in-game, because there very well might be another side of the map or another hemisphere. We just don’t know how big Azeroth actually is. And I’d guess Blizzard doesn’t know, either. If they want to add more landmasses, they will. If they don’t want to, they don’t — and they don’t exist until they do. is there a way to tell when you have all the basic cards for Hearthstone? I only use gold to buy boosters and I am a little bit of a completionest. You got lucky with the new one, and were unlucky with the previous versions. It happens. I got quite a few of the new pets my first trek through Raiding with Leashes, but I have yet to get even one of the pets from Naxxramas. I don’t run it religiously — I don’t want those pets that badly — but I figured I’d have at least gotten one of them by now. No dice. What do you guys think of the zones pre-catalcysm (vanilla) versus the zones in Azeroth now? In my opinion, most of the zones are better now, while a few really lost the soul of the original and didn’t replace it with anything compelling. Let me use a potentially bad example: Desolace. 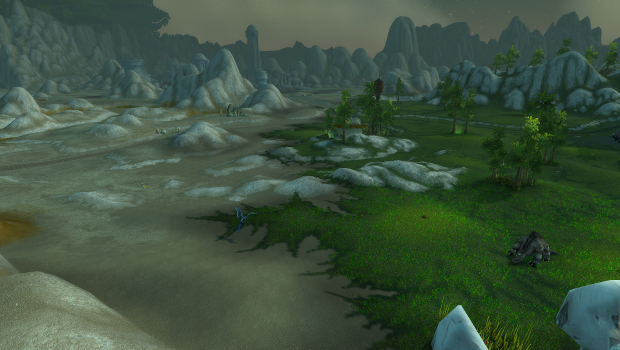 A lot of people didn’t like Desolace, but I felt it was true to itself: it was a desolate wasteland. Was it the most exciting zone? No, but I still liked it. The new Desolace doesn’t do anything particularly interesting, but it also lost what little it did interesting previously. In the process, it lost its artistic vision by dropping globs of green in it. If they were progressing the story of that zone, they should’ve either turned the whole thing lush and green or maintained the wastelend. Ashenvale is another one that bothers people. For the Alliance, it’s a whole lot of death and destruction and also a random volcano that totally screws with the zone’s aesthetic. Cataclysm, in its redesign of the old world, relied on the actual Cataclysm event too heavily. The zones based around natural disasters brought on by that event are permanently scarred for an event that’s already years in our real world past. The zones that based their redesign on story progression — like the Plaguelands — turned out much better. I’ll still miss the spooky, creepy Plaguelands of old, but seeing the narrative progress there is really cool, too.